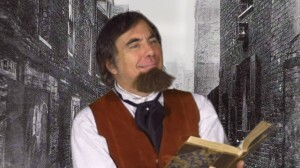 This fast-paced program deals with the writer’s unique connections to western Virginia, and includes sections from his works - including 'A Christmas Carol', 'Great Expectations', 'A Tale of Two Cities', 'Oliver Twist', 'Nicholas Nickleby', and 'David Copperfield,' as well as some of the writer's works written about coal (such as the poignant "A Miner's Evidence.") Charles Dickens is portrayed by actor and scholar George Bartley (Edgar Allan Poe for the West Virginia Humanities Council History Alive program,) and on October 1, 2012 the Raleigh County Public Library is hosting George to recreate part of Dickens’s wildly successful 1842 tour of America. On the ship during the journey from England to America, Charles Dickens became friends with Joseph “Diss” DeBar. The picture that Debar drew of Dickens is now one of the treasures of the Department of Archive and History of the State of West Virginia. DeBar later designed the West Virginia state seal and is responsible for the state motto “Mountaineers Are Always Free”. Come to this delightful and educational program, and help the Raleigh County Public Library celebrate the world’s greatest novelist during the bicentennial of his birth.